An association was found between cough severity/impact and the reported use of opioids and other antitussive treatments. A longitudinal study published in CHEST demonstrated that cough is a severe symptom in lung cancer and is associated with gastrointestinal symptoms. Researchers investigated how cough severity frequency affects patients with lung cancer over time and assessed associated cough severity clinical factors and cough impact over time. The study population (N=153) included participants at an outpatient clinic assessed on the Manchester Cough in Lung Cancer (MCLC) scale, the Cough Severity Visual Analogue Scale (VAS), Cough Severity Diary, European Organisation for Research and Treatment of Cancer Quality of Life Questionnaire’s — Lung Cancer module, Common Terminology Criteria for Adverse Events version 4.0, Brief Reflux Inventory, and the World Health Organization Performance Status at 3 time points (study entry, day 30, and day 60). The median duration of reported cough at study entry was 52 weeks (interquartile range, 8.5-260), the cough was severe enough that it warranted treatment in 62% of participants. 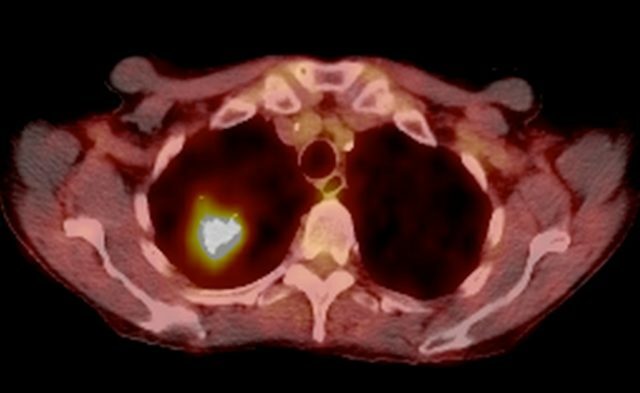 Cough preceded a lung cancer diagnosis by a median of 12.4 weeks, but the range varied considerably among patients. There were significant changes observed in median forced expiratory volume in 1 second values, the proportion of anticancer therapeutics received, and the proportion of patients on precancer therapy. Cough scores improved over the duration of the study regardless of the assessment tool used and was most evident during the Day 0 to Day 30 interval. Some clinical factors (performance status, gastrointestinal symptoms [ie nausea and reflux]) were associated with cough impact (MCLC score) and cough severity scores (VAS score) at study entry. In addition, there was an association between cough severity/impact and the reported use of opioids and other antitussive treatments. Among the study limitations, the researchers noted that the length (60 days) compared with the overall disease trajectory was considered short as well as only 62% of patients completing the the VAS responses. These findings suggest cough is a severe and distressing symptom in lung cancer and is associated with gastrointestinal symptoms. Disclosures: Dr Smith is a named inventor on a patent describing detection of a cough from sound recordings, which is owned by University Hospital of South Manchester and licensed to Vitalograph, Ltd.